The work of Graciela Iturbide is a good example of how photography expanded in conception and expression after World War II (1939–1945). There have been quite a few other women photographers who have documented indigenous peoples of Central and South America, among them Claudia Andujar (Brazil, born 1931 Switzerland) and Mary Ellen Mark (1940–2015). I’d rather see the idea of the “Family of Man” represented by artists such as this rather than the Western European/American slant on “cultural relativism.” I can’t say enough about how important I think the work of artists like Iturbide is in broadening people’s grasp on the incredible diversity of humanity. 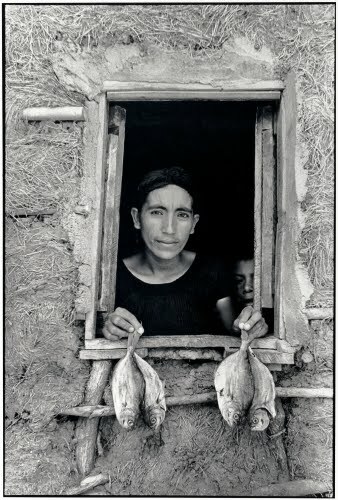 Although many photographers in Mexico continued to observe European and American aesthetics in photography after World War II, there was a growing rejection among Central and South American artists to the idea of the “American Way of Life,” a socio-economic yardstick that was held up as the standard of a successful society. In 1978, the First Colloquium of Latin American Photographers was held in Mexico City. What emerged from that was the attempt to explore a separate and distinctive identity in Latin American art. In Mexico, photographers had already turned in a major way to local subject matter before that meeting in Mexico City. Iturbide was among those photographers who documented urban and rural ordinary people. Her focus is often on the adaptation of traditional life to the contemporary world. The urge to trace the persistence of ancient, pre-conquest cultural aspects in the modern world is a common thread in contemporary Mexican photography. Born in Mexico City, Iturbide was exposed to photography as a young woman. She turned to photography as a vocation in 1970, and then studied filmography and cinema at the Centro Universitario de Estudios Cinematográficos at the National University of Mexico. There she met her mentor, the great Mexican photographer Manuel Álvarez Bravo (1902–2002). She became interested in photographing Mexico’s indigenous cultures and the life of Mexicans along the Mexican-American border. This image reflects Iturbide’s interest in feminism. It was shot in the town of Juchitán, Oaxaca, where the women dominated town life. Her photographs reveal her strong sense of the dignity of every human being. This respect has led her in recent years to document the relationship of human beings with the natural environment.